Paper: Whisper White, Wild Wasabi, Chocolate Chip, Real Red, Holly Berry Bouquet Designer Series Paper, Silver Glimmer Paper, Red Glimmer Paper. Ink: Chocolate Chip, Wild Wasabi. 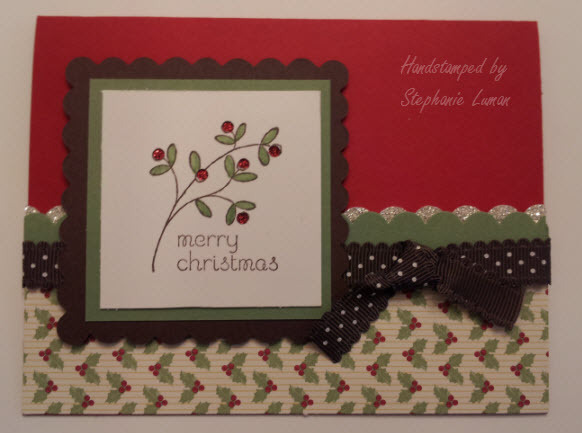 Accessories: Crop-A-Dile, Big Shot Die-Cutting Machine, Scallop Squares Duo Bigz Die, Chocolate Chip 1/2″ Scallop Dots Ribbon, Scallop Edge Border Punch, Stampin’ Dimensionals. Use your Crop-A-Dile to punch holes where each berry is and then place a square of Red Glimmer Paper behind the Whisper White square. Paper: Whisper White, Not Quite Navy, Bashful Blue, Night Of Navy, Silver Glimmer Paper. Ink: Bashful Blue, Not Quite Navy, Night Of Navy, Pumpkin Pie. 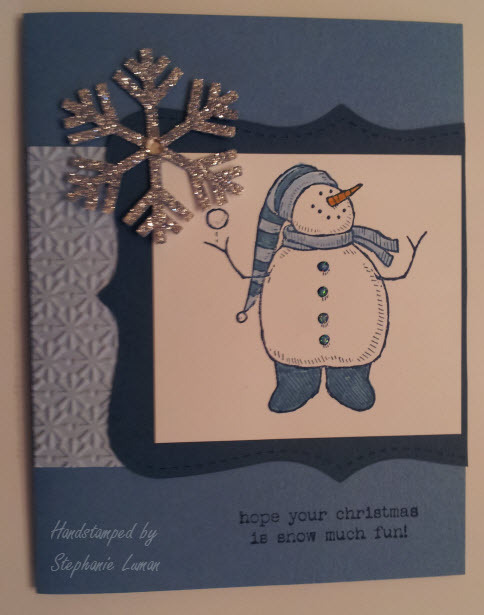 Accessories: Big Shot Die-Cutting Machine, Top Note Bigz Die, Snow Burst Textured Impressions Embossing Folder, Snowflake Punch, Dazzling Details, Basic Rhinestones, Stampin’ Dimensionals, Heat Tool. The snowflake is dyed with Bashful Blue reinker. There are several ways to do this but the easiest I have found is just paint the ink directly onto the glimmer paper and heat dry. Hello there,i just got this stamp set and i was wondering where you got the embossing folder that you use?